Last summer, I used the contour lines on a topographic map to find my way around the Adirondacks. When I joined Google Seattle as an intern in the fall, I was hoping to do something that would impact everyday users. I was given the same responsibility and freedom that a full-timer enjoys, and armed with this, I set out to add contour lines to Terrain Maps -- not just in the Adirondacks, but across the globe! 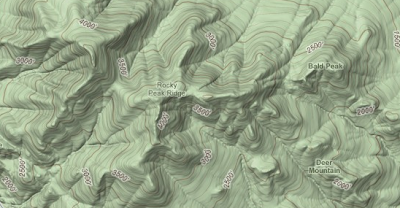 Now when you view Terrain Maps, you'll see contour lines, making it easier to determine the slope of the land. Contour lines depict elevation change by connecting points of equal elevation. Where contour lines are close together, you can expect a steep slope; where they are spread out, you can expect flatter terrain. They help highlight the elevation of areas like cities or plains where shading alone doesn't capture gradual changes in elevation. Now, at a glance you can see the height of the world's peaks, or plan your next camping trip. Contour lines can even help you find a flatter bike route for your daily commute, which is key if you live in a city like Seattle. And with this release just in time for my next internship this summer, I'm looking forward to hiking Mt. Rainier.